The reason you test drive a car before you buy it is so you can first experience how it feels. Nuances like how the dash looks when you’re behind the wheel, or how you navigate the radio, can determine whether you buy a specific vehicle or not. The same is true of a spa. You want to make sure it not only looks right, but it also feels right. That’s the purpose of the test soak. To get the most out of your test soak, it helps to know exactly what to expect. Bring your bathing suit and towels with you. It might feel a little awkward, but you want to make sure you’re as comfortable as possible when you try out a spa. Our test soaks are private, so you can settle in and be comfortable. Take a moment to enjoy the comfort of the spa, but don’t forget the reason that you’re here. You came in for your test soak to try before you buy. Think back to your wish list and see how this hot tub or swim spa stacks up with what you want. You want a spa that’s just the right size… not too big or too small. During your test soak, sit in there with everyone in your family, including your kids, so you can determine if that spa is the size that you need. While you’re in there, think about how the spa will fit in your backyard, because you want something that complements your landscape if possible. 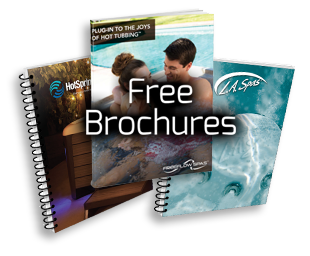 When people test out a hot tub or a swim spa, they think about many details. However, people often forget about their feet. Do you have enough room for your feet in the foot well (even if all of your family is with you)? Do you want jets to massage your feet? How do they feel? On brisk Florida nights, you want the spa seats to be deep enough that the water can cover your shoulders to keep you warm, even when there’s a chill in the air. If the seats are deep enough, are they comfortable? Several spas offer multi-level seating so adults and children can both be comfortable. Check to see if the seats are appropriate for your children and for yourself as well. Test the lounge seat as well, because some customers love them and others don’t (because they can float away). If you opt for lounge seats, make sure they work for you and all of your other family members who will use them. Real estate is about location, location, location. In the spa industry, it’s all about the jets. Take note of the jets during your test soak and where those jets are placed. Hydrotherapy is one of the most common requests among spa customers, so you want to make sure the jets work for the areas that you want. A variety of jets are available, including those that work your back, shoulders, wrists, and even calves. Feel each jet, and don’t hesitate to ask questions while you’re there. Nothing ruins a relaxing time in the spa like an annoying buzz or hum. When the water is circulating and the motor is running, you want to make sure you can still be a peace. You don’t want an irritating noise to spoil it. Take a moment in the silence to listen to the sound the hot tub makes when it’s running to make sure it’s up to your standard. The water in our hot tubs and swim spas is an experience of its own. It smells fresh, and can provide a relaxing aromatherapy environment if you desire. You’ll also notice how great your skin feels after you’re in one of our spas. Your skin won’t dry out after spending time in a test soak; instead, it will feel silky smooth. Ask the sales representative about the chemicals we use in our test soak spas so you can replicate that same feeling at home. You want something that smells great, feels great, and is easy to maintain. Call us today and set up your test soak so you can experience the relaxation a spa can provide for you and your family.